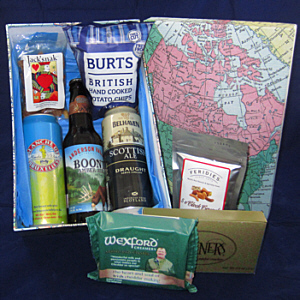 Open up this red suede box and find an English pub. It has three kinds of beer (Murphy's Red, Morland "Old Speckled Hen" and Belhaven Scottish Ale), roasted peanuts, delicious Harlech cheese (cheddar with horseradish and parsley) and snack mix. The red suede box will be handy to store photos, CDs or anything else you like.